Clarence Goodson led the U.S. soccer team onto the Stanford Stadium field for Day 1 of World Cup training, about 20 paces ahead of teammates. Goodson was a member of the 2010 U.S. World Cup team, and the 6-foot-4 defender is hoping that experience will help him earn a trip to Brazil next month, and a greater role this time around. The competition at his position is stiff, given that coach Jurgen Klinsmann’s preliminary 30-player roster features 11 defenders, and he must trim the roster to 23 by June 2. Goodson, who plays for the San Jose Earthquakes some 20 minutes down the freeway from Stanford University, is among the more experienced American players in training camp, with 46 international appearances, yet the center back was an unused substitute who never saw the field four years ago in South Africa. Goodson and the Americans are training at Stanford ahead of an exhibition against Azerbaijan on May 27 at San Francisco’s Candlestick Park. There also will be a June 1 match versus Turkey at Harrison, New Jersey, and a game with Nigeria six days later at Jacksonville, Florida. The U.S. squad will then travel to its base camp in Sao Paulo to prepare for its Group G opener against Ghana on June 16 at Natal. Midfielder Maurice Edu was cleared to participate in Thursday’s training after sitting out Wednesday’s first session because of concussion-like symptoms. Goodson expects to compete for the starting spot at center back — and Klinsmann has said depth at all positions will be important in case of injuries or other factors throughout the World Cup. After Wednesday’s initial 90-minute training, Goodson signed autographs for a small group of children waiting outside Stanford Stadium. Earthquakes coach Mark Watson believes Goodson has not only earned the opportunity to play in a second World Cup, but also to take on a greater role than he had during the 2010 tournament. Goodson returned to MLS midseason last year following more than five years in Europe, with both Norway’s Start and the large Danish club, Brondby. He appreciates seeing the sun in the Bay Area, given his long stint in Scandinavia. 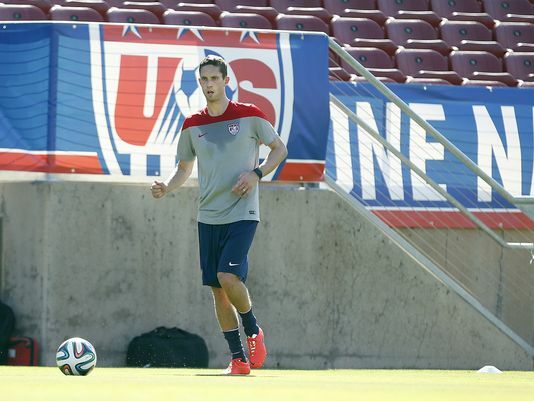 He played a key role during last year’s World Cup qualifying and was a member of the CONCACAF Gold Cup roster. After making his season debut for San Jose on Aug. 3, Goodson was part of a back line that surrendered only two goals over the final two months of the regular season. Goodson has the backing of another U.S. and MLS teammate, Earthquakes forward Chris Wondolowski. NOTES: MF Michael Bradley, F Clint Dempsey, MF Graham Zusi and D Matt Besler all joined the team Thursday and were expected to practice in some capacity. The additions gave the U.S. 26 players including a guest goal keeper. … Thursday’s training included a sprinting exercise called the “beep” test, in which players must complete their bursts between cones before hearing the beep. You are currently reading US defender Goodson seeks great role at World Cup at ARE YOU NEXT.